Last weekend, I visited Rocky Nook Park, located at the beginning of Santa Barbara's Mission Canyon. 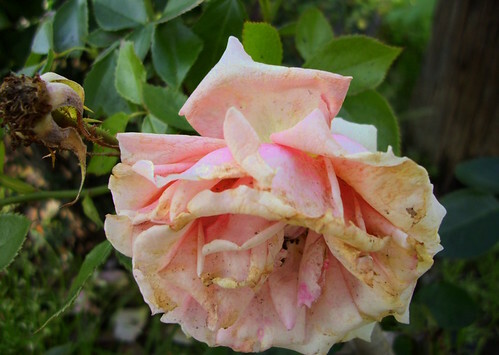 Owned and maintained by the County of Santa Barbara, it's located just minutes from downtown. There are a few tables and group picnic areas, and a children's play area with rings and swings and a slide; the rest of the park is primal and pristine. There are places where you can stand, and turn around a full 360 degrees - and not see any evidence of civilization at all. 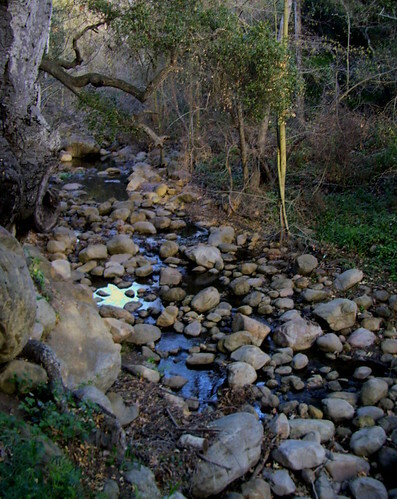 During the winter and springtime, water flows in beautiful Mission Creek that skirts alongside the park. In the summer, the creekbed is dry and hot. 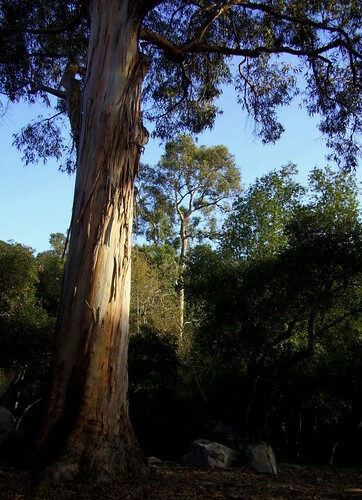 The creek and canyon are lined with California Sycamores, shrubs, and live oaks that have dark, leathery leaves. Long and serpentine branches arch over the water. The park is inhabited by animals, birds, a small forest, and grass that erupts with wildflower bloom in the spring. There are winding trails and paths - here and there. During my recent visit, two indigo blue scrub jays flitted around me amongst the trees. The afternoon was warm, the air was soft and quiet. But for the past three days, it has been raining like there will be no tomorrow. We're having a Pacific Coast deluge, a real winter storm. The mountains are pummeled by ferocious winds and torrents of rain; the sea is producing thick, churning waves that break into white foam on the sand, with backspray lifting into the air. Roads are slick with ponded water - streets are closed, warnings have been issued. The forecast is for more - more rain, more wind, more flooding, more mud, more rock slides. This morning, among all the dire predictions, I thought again of Rocky Nook Park, and the boulders that are nestled all around. 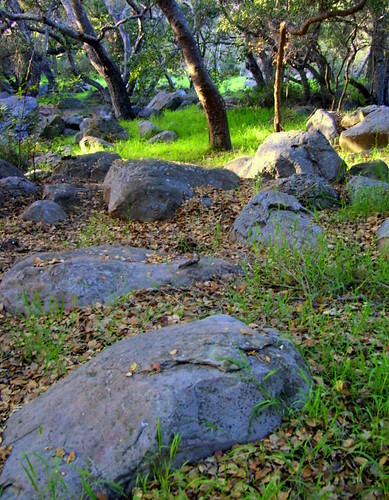 The streambed is full of rocks and boulders. Hills and fields are strewn with them. They are substantial; they gather, partially submerged, as in a herd. They are familial and clan-like, living among the oaks and fallen leaves. They have presence. The rocks vary in size from a foot in diameter to some that are as big as a car. They are beautiful, sculptural, molded by time and weather. 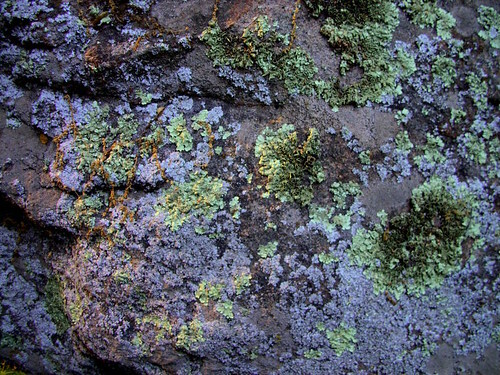 Most of them wear cloaks of moss and lichen. I swear these rocks are sentient. In their presence I can imagine this as a fairy forest, an ancient holy site, or the intersection of ley lines, where magic may happen. "The city is built upon a landform known as an alluvial fan, a fan-shaped deposit consisting of stream gravels and debris flow deposits with an apex near the Santa Barbara Museum of Natural History," explained Keller. 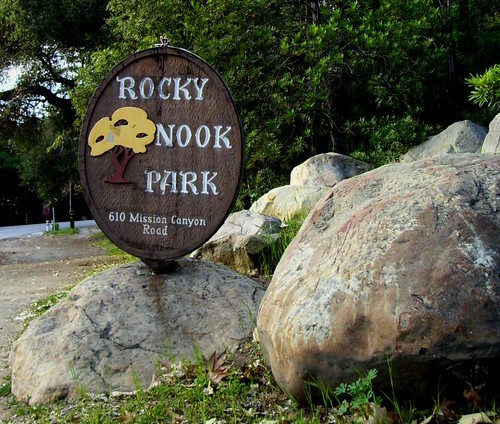 "Rocky Nook is known for the beautiful, large boulders scattered throughout the park. These boulders are composed of sandstone from the Santa Ynez Mountains... We believe they record a catastrophic debris flow that occurred sometime in the recent geologic past," meaning within the past few thousand years. The boulders are easily transported by the flow because the high density mixture of water, fine sediment, and boulders allows large boulders to "float" like corks on the top of the flow, explained Selting. The finer particles that were initially between the boulders drain away with the water in the debris flow, leaving the pile of open framework boulders behind. The cause of the prehistoric Mission debris flow is of considerable interest to Selting and Keller. The debris flow most likely originated in Rattlesnake Canyon, near Skofield Park, about a mile from the Rocky Nook Park deposits. Based on their research, the scientists propose that a large landslide, with a volume around 10 million cubic yards, blocked Rattlesnake Creek at the present location of Skofield Park, forming a landslide dam in the canyon about 60 to 100 feet high. "The presence of the landslide dam caused water to back up into Rattlesnake Canyon forming a temporary lake," said Selting, "and the failure of the dam most likely resulted when it was overtopped by the trapped water." The water-saturated landslide deposits in the dam, including the large boulders of sandstone, were mobilized into the Mission debris flow, which surged down the canyon, filling it with boulder debris to an estimated depth of 20 to 30 feet, say the researchers. At the canyon mouth near Rocky Nook Park, the large debris flow spread out, destroying and burying everything in its path. Debris flows can move at speeds ranging from 1 to 100 miles per hour. So when I woke to the sounds of more rain this morning, to cataclysmic predictions of floods and tornadoes, mud slides and debris flows - I imagined the earlier cataclysm that happened about 2,000 years ago - when these huge, ancient chunks of Santa Barbara sandstone rushed down creeks and canyons. The ground must have trembled at the flow of silt, mud, rock, and trees. The canyon walls must have roared with the progress of the stampede, the noise of it echoing for miles. And when it was over, the land had been rearranged, paved 30 feet deep, with layer after layer of mud and rock. 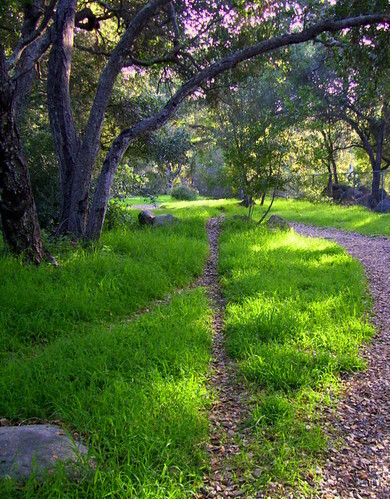 But now, Rocky Nook Park is one of the most beautiful and peaceful places in Santa Barbara. The water in the creek moves at a slow trickle. Tall trees shush in the breeze. I am sure that it is Magic that rustles among the fallen leaves. 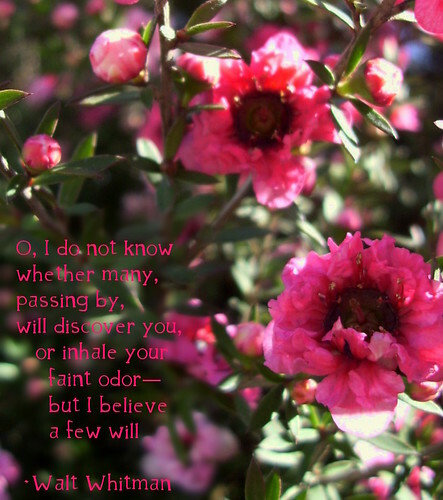 Rocky Nook Park is a peaceful pocket of heaven, where you can find a bit of the eternal.